Mention “poodle to someone who has never owned or known one and it will typically conjure up images of pampered pets sporting outlandish haircuts being doted upon by old dowagers… In short, poodles don’t do well in the PR department with the mainstream uninformed. But it wasn’t always that way. Historically, it’s only recently that poodles have had to endure their bad rap in the public eye. The poodle has been around for a long time. Ancient Egyptian and Roman artefacts often depict the poodle’s ancestors assisting their owner’s as they bring in game nets, herd a variety of animals or retrieve selected catches from various marshes. The poodle’s true ancestry is as murky as the marshes it originally learned to work in. One commonly held belief is that it descended from Asian herding dogs then travelled west with the Germanic tribes known as Goths and Ostrogoths to eventually become a German water dog. Another theory holds that it was brought out of the Asian Steppes by the conquering North African Berbers and eventually found its way into Portugal in the 8th Centruy with the Moors. That’s why even today, it’s believed that the poodle is related to the famous Portuguese water dog — a working dog with a long curly coat, renowned for its intelligence, speed, agility and ruggedness both in and out of the water. For centuries, the poodle’s intelligence and personality made it a favourite with gypsies and other travelling performers who trained it to perform tricks and skits to the delight of paying spectators. Accounts of famous royal command performances along with stories of amazing street shows are littered throughout the historical record. Variety shows featuring poodles dressed in costumes and displaying amazing feats of intelligence, balance and agility became all the rage in the 19th century. 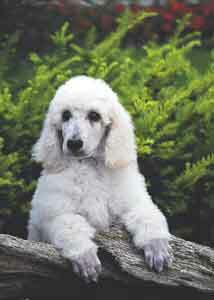 One of the most misunderstood aspects of poodles is why they are clipped in such an array of seemingly bizarre styles. 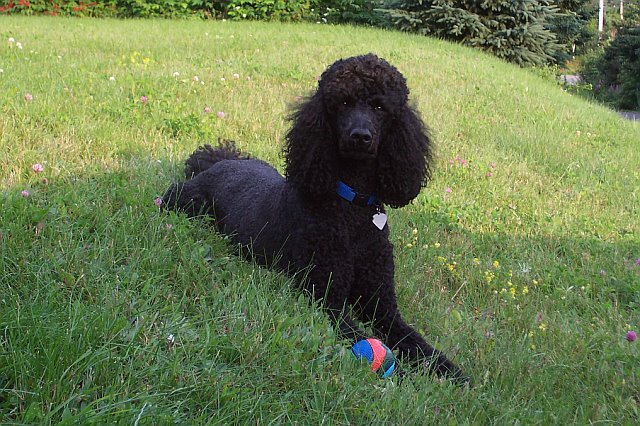 The fact is that the distinctively shaved areas and tufts of hair – the unique poodle “look” — are a direct result of the poodle’s working and sporting heritage. In order to protect the poodle’s vital organs and joints from the biting cold of constant water retrieval, certain areas were shaved for added mobility and to lessen the chance of snagging while other key areas were left densely covered for warmth. The ribbon commonly found tied into a poodle’s topknot, is believed to have originally been a means of finding and identifying the dog when it was working in water. Poodles have worked in virtually every capacity a dog is capable of filling. From a cart-pulling draught animal to parlour room trickster, from sled dog to assistive guide dog, from warrior to rest home companion, from truffle hound to eminently competent bird dog, and from watchdog to show ring master, the poodle excels at everything it sets its mind to. With such a rich and varied history, the poodle is a master of all trades and one of the finest companions any human could ever hope for.